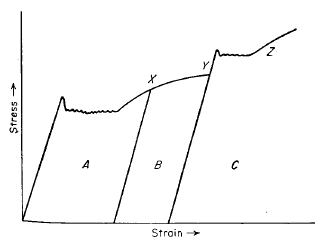 Why does the stress-strain curve decrease? I have noticed that the curve decreases between points C & D and between E & F. Why does that happen? I expected the curve to always increase since the tension force in a tensile test is always increasing and the cross sectional area of the specimen decreases, which means that the stress is always increasing. For the explanation of the loss of stress from E to F, I'll refer you to my answer to another question. Basically, the drop in stress seen in the diagram is a consequence of the fact that we use engineering stress (not taking the loss of cross-sectional area into consideration) instead of true stress. In a true stress diagram, there is no such drop. See this question for answers to why we use engineering stress instead of true stress. Now, as for why there's a drop between C and D, that has nothing to do with our use of engineering stress (though the drop is smaller in a true stress diagram). Instead, that occurs due to the steel's microstructure. Since I'm not a materials engineer, I apologize for the "loose" vocabulary I will use to explain this phenomenon. This happens due to the fact that steel contains carbon which occupies interstitials and effectively impedes the "flow" of the surrounding material that wants to yield at the lower yield value. Additional stress is required to overcome the carbon's resistance, at which point everything can move uninterrupted, which means that the material can then continue to yield at a lower stress. So the upper yield stress is momentary. Once that is overcome, the yield stress drops to the lower value. To add to the other answers: interstitial solutes effectively "lock" dislocations in BCC metals (such as with carbon and nitrogen dissolved in iron), by forming what are called Cottrell atmospheres (Wikipedia). The lowest free energy is achieved when the interstitial atoms are in the dislocation, because the dislocation has a larger interatomic spacing due to the missing atomic plane. Thus, over time, the interstitials will gradually migrate to, and remain at, the dislocations. The interstitials locally strain the lattice around the dislocation, increasing the stress required to move the dislocation. The effect of Cottrell atmospheres is to increase the yield strength of the material, creating an upper yield point at C in the diagram. If the carbon is unable to diffuse as quickly as the dislocations glide, then when point C is reached, the dislocations move away from the carbon and become "unlocked." When unlocked, the stress required to move the dislocations decreases, resulting in a lower yield point at D in the diagram. While the dislocations are moving due to the increasing strain, the density of dislocations is increasing, i.e. work hardening. Between C and D, the decrease in strength from dislocation unlocking is more rapid than the strength increase caused by work hardening. After D, the strength can no longer decrease, so the normal work hardening curve resumes. Suppose you were to strain the material to somewhere between C and D, stop, and then allow the material to sit for a few days. After allowing the material to age, you then resumed straining the material, it will have regained its yield strength, and to a point higher than C. The reason is that by aging the material, the carbon has had time to diffuse to the dislocations again. Additionally, the increased dislocation density and thus work hardening would have also increased the strength of the material. This effect is called static strain aging: the material is allowed to age after extension to a static (constant) strain. It is worth noting that at or above the temperature where interstitial diffusion is as fast as the dislocation motion, the upper and lower yield point phenomena change into a serration on the stress-strain curve. This effect is known as dynamic strain aging, in contrast with static strain aging, because the material is being aged as fast as, and while, it is being strained. The effect is shown in the diagram below. One may also change decrease the strain rate to achieve a similar effect to increasing the temperature. In the diagram, at X the sample is unloaded and then immediately reloaded. At Y the sample is unloaded and allowed to age for sufficient time. Note the recovery of the yield point to a higher value than originally: static strain aging. Note that there are serrations after the upper yield point, which indicates the material is being strained sufficiently slowly to allow the carbon to catch up to the dislocations, i.e. dynamic strain aging. Image from GATE Metallurgical Engineering. Not the answer you're looking for? Browse other questions tagged mechanical-engineering materials civil-engineering industrial-engineering strength or ask your own question. Why do we even use engineering stress? Why is the point of failure load lower than the peak load? Why is strain also normalized to the parameters of engineering strain? How does a graph with tensile stress-strain curve and compressive stress-strain curve superimposed look like involving true stress and true strain? Does unloading beyond yield point also affect tensile strength? Why are the processes called “Precipitation Hardening” and “Solid Solution Strenghtening”? Do all ductile materials experience necking before fracture? No increase in temperature during bending? How to determine gradient of load/extension graph?